It all started in 1988 with Basel I, a document provided by the Basel Committee on Banking Supervision (BCBS) which gave life to the Basel Accords. The Basel Accords are recommendations on banking laws and regulations. A key proposal of Basel I was to reduce bank exposure to credit risk by holding enough capital; 8% of its risk-weighted assets. In June 2004, BCBS issued a revised version of the Basel Accords, Basel II. 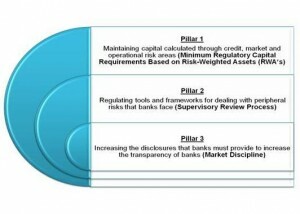 The Accords were amended in order to facilitate a more comprehensive, sophisticated and risk-sensitive approach for banks to calculate regulatory capital necessary to protect against various types of risks. The recent financial crisis underlined a number of weak areas in the Basel II rules. On September 12, 2010, the Group of Central Bank Governors and Heads of Supervision, the oversight body of the BCBS issued a press release announcing its full endorsement of the agreement it had reached on July, 26 2010 in relation to the proposed reforms to the Basel II framework. These proposed reforms have been endorsed by G-20 on November 12, 2010 at the Seoul Summit and are now referred to as Basel III. Basel III was essentially designed to address the weaknesses of the recent crisis; however its intent is to prepare the banking industry for future economic downturns as well. The framework enhances firm-specific measures and includes macroprudential regulations to help create a more stable banking sector. The basic structure of Basel III remains unchanged with three mutually reinforcing pillars. Basel III has introduced a much stricter definition of capital. Higher quality capital means more loss-absorbing capacity, which in turn means that banks will be stronger, allowing them to better withstand periods of stress. Banks will be required to hold a capital conservation buffer of 2.5%. The purpose of the conservation buffer is to ensure that banks maintain a cushion of capital that can be used to absorb losses during periods of financial and economic stress. The objective of the countercyclical buffer is to increase capital requirements in good times and decrease in bad times. The buffer will slow banking activity when it overheats and will encourage lending when times are tough. The buffer will range from 0% to 2.5%, consisting of common equity or other fully loss-absorbing capital. The minimum requirement for common equity, the highest form of loss-absorbing capital, is raised from the current 2% to 4.5% of total risk-weighted assets. The overall Tier 1 capital requirement, consisting of not only common equity but also other qualifying financial instruments, will increase from the current minimum of 4% to 6%. The minimum total capital requirement will remain at the current 8% level; however, the required total capital will increase to 10.5% when combined with the conservation buffer. The financial crises pointed out that the value of many assets fell more quickly than assumed from historical experience. As a result, Basel III rules include a leverage ratio to serve as a safety net. A leverage ratio is the relative amount of capital to total assets (not risk-weighted). This aims to put a cap on swelling of leverage in the banking sector on a global basis. A 3 percent leverage ratio of Tier 1 will be tested before a mandatory leverage ratio is introduced in January 2018. A framework for liquidity risk management will be created. A new Liquidity Coverage Ratio (LCR) and Net Stable Funding Ratio (NSFR) will be introduced in 2015 and 2018, respectively. These two ratios will be discussed in detail in future articles regarding liquidity risk. As part of the macroprudential framework, systemically important banks will be expected to have loss-absorbing capability beyond the Basel III requirements. Options for implementation include capital surcharges, contingent capital and bail-in-debt.